Searching around for the best sports watch was pretty fun I have to say. I settled with the Garmin Fenix 3 HR and I’m very pleased with it. It came down to the GF3HR Sapphire, the Apple Watch S2 or the GF5HR. 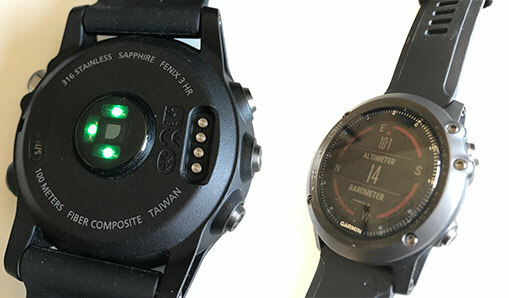 The Garmin Fenix 5 HR didn’t really appeal to me for the extra money, who needs the quick release strap? I don’t think I will ever need to change the strap unless this one breaks. And then how long will that take 5 minutes max? I’ve started to cycle to my place of work as well and do a little evening running. I’ve rather eagerly signed up for the Lymington Lifeboat 10Km race on the 14th May. Some say with the little amount of exercise I do is it worth spending so much on a watch? I guess it’s true. The first thing I did when my Garmin Fenix 3 HR arrived was to open it, marvel at it and charge it. It took about 1 hour to fully charge. Not bad. Then I started playing with the settings and changed the watch face to something that I liked. I wanted something with the heart rate bpm on it, and settled for one I found in the Connect IQ download list. I liked how easy it was to sign up to Garmin Connect as well as download Garmin Express on my computer. The whole signup process was all very straight forward. I have my Garmin Connect account synced with my Strava account, so when I go for a run or cycle (or swim) it automatically syncs. Very clever! The watch feels very comfortable on my wrist, very lightweight, and as I am used to always wearing a watch, sometimes I forget that it’s even there. The Sapphire version is a finger print magnet and I also scratched the bevel within the first 24hours which I was annoyed about. I went for the Sapphire because everyone said it was so much tougher than the original GF3 silver. This maybe the case for just the screen but the bevel, I am unsure about. One thing that does irritate me somewhat is that if you’re not near your phone or your phone is near but hasn’t got the Garmin connect app running, apps/widgets like the weather do not work. It just says “Follow steps on Garmin Connect Mobile to pair”. All in all I would rate the Garmin Fenix 3 HR Sapphire a 8 out of 10. Battery life for me lasts up to around 4-5 days. Weather doesn’t work for me if the mobile app not running or if phone is not nearby. The screen is not great in the dark.